Abdio Word Viewer is an easy-to-use Free Word Viewer, You can read MicroSoft Word 2007 (*.DOCX), MicroSoft Word 97-2003(*.DOC), Hyper Text Markup Language (*.Htm,*.Html), Plain Text Format (*.TXT), Rich Text Format (*.RTF) and You can convert Word 2007(docx), Word 97~2003(doc) Txt Html Rtf to PDF DOCX DOC TXT. 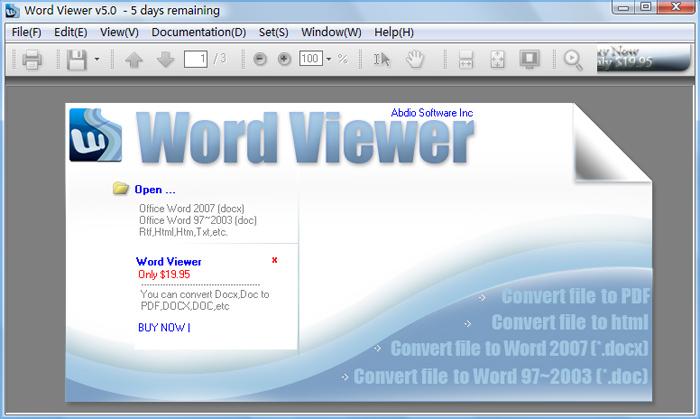 Abdio Word Viewer is a multilingual software, including English, Chinese, German, French, Italian, Japanese. Word Viewer is an easy-to-use Free Word Viewer and you can convert file format. ...... Very user-friendly interface and easy to use. How to get Abdio Word Viewer full registered version? Swords by Swords of Might. Huge swords selection at great prices. WordEm is a fast-paced, arcade style word puzzler game! Qweas is providing links to Abdio Word Viewer 5.84 as a courtesy, and makes no representations regarding Abdio Word Viewer or any other applications or any information related thereto. Any questions, complaints or claims regarding this application Abdio Word Viewer 5.84 must be directed to the appropriate software vendor. You may click the publisher link of Abdio Word Viewer on the top of this page to get more details about the vendor.